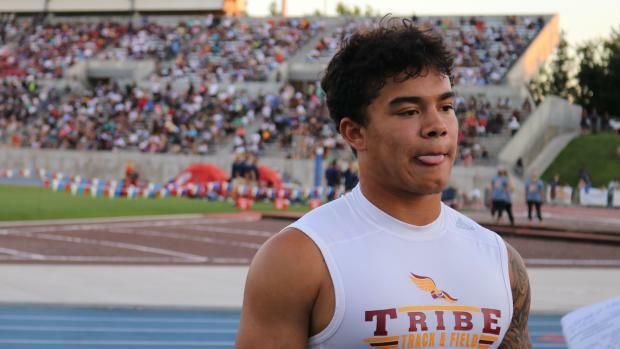 CLOVIS -- When Yucaipa's Asani Hampton blazed to a near-record 100-meter dash time of 10.34 in the 100th Annual California State Track and Field Championship prelims, anyone who followed high school track in the Golden State thought records would tumble. Certainly the 26-year-old meet record of 10.30 by San Diego Southwest's Riley Washington in 1992 and, since he'd clocked a 10.26 earlier, maybe the all-time state best of 10.25 set by Hawthorne's Henry Thomas in 1985. Tulare High's Kazmier Allen had other plans. A football star who is headed to UCLA in the fall and had only been running track for 13 months, Allen pulled the upset of the meet by winning the century in 10.44 - barely edging Hampton's 10.45 - on a warm Saturday evening. Consider that this was a running back who scored a national record 72 touchdowns while gaining 3,336 yards rushing and another 833 receiving. He treated the 100 field like just another defensive back trying to catch him after charging to the finish line before an appreciative crowd at Buchanan High's Memorial Stadium. Form held in the 200-meter dash when Murrieta Mesa's Christian Shakir-Ricks chased down Hampton, his year-long friendly rival, cracking 21-seconds at 20.99. Allen knows his place in the big picture. "They're track guys but that's not necessarily my thing," said the solidly-built 5-foot-10, 180-pounder. "I just started running last spring in May but I knew I was fast and I finished sixth in the state meet." Maybe the others had missed the fact that flying under the radar, he had not lost a race all year. "I never think second or third," said Allen who plans to run track for the Bruins next spring. "I think the strength I gained playing football helped me at finish. I'm probably the strongest one here but I don't have much technique." Allen says he plans to keep things simple this coming week when he graduates and will report to UCLA on June 25 to get a start on his classes. Hampton was actually only .003 seconds behind Allen. "I was disappointed in the 100," said the Michigan-bound Hampton, who didn't get the same rocket start he did in the prelims but still charged into the lead at 40 meters. Allen stayed right on his shoulder and inched past at the finish line. The Yucaipa senior would also run a completely different race in the 200 from the night before when he took the lead and Shakir-Ricks had to work extra hard to run him down. Hampton got a PR at 21.13 but Ricks was thrilled when a 20.99 appeared on the scoreboard, his first time under 21. "You don't know how glorious a triumph that was," said Shakir-Ricks, who made good time running from the awards stand to join his teammates for the 4x400 relay which the Rams won in a national-best 3:10.86 to secure the boys' team title, over Southwestern League rival Great Oak. "Going from a 3:28 to a 3:10.86 in the relay shows the dedication this team has had since day 1," said Shakir-Ricks. "I started the season with a 21.9 and finished with a 20.99. Then we set a school record and a national best time in the relay-amazing." What was amazing in the relay was Shakir-Ricks' effort, coming from second place to roar into the lead without the slightest sign of letting up going into the tape in a 45.6 split. The 3:10.86 was faster than the 3:11.38 recorded by former US #1 DeSoto of Texas, and a fitting climax.